Amplo apartamento para 4 pessoas, com magnífica vista para o a baía de Albufeira, com acesso directo para a praia por escadas ou elevador. Perto de todas as atracções turísticas e com condições para um descanso de sonho. Uma das vistas mais belas da região sul com tudo o necessário a 5 metros da praia. No dia de saída o apartamento deverá ficar livre às 11 horas. Apartamento espaçoso com excelente vista, anfitriões muito simpáticos e prestáveis. We have just returned home from a stay in this beautiful apartment , the location couldn’t be better, the view is stunning and the walks along the beach or into town are very convenient . The apartment is well equipped and very well maintained , clean and comfortable . The owners are extremely friendly and obliging , they even left us a welcome pack which was very kind . I would highly recommend the apartment and give it 5* . Beautiful apartment with breathtaking views. We recently spent 4 nights in this lovely apartment. The charming owners had literally thought of everything - the accommodation was faultless and spotlessly clean. The view from the living room and bedroom was incredible- we spent hours just gazing at the beautiful beach below. All in all, if you are lucky enough to find this accommodation available then do not hesitate- book it - you will love it ! A great view of the sea from the balcony! 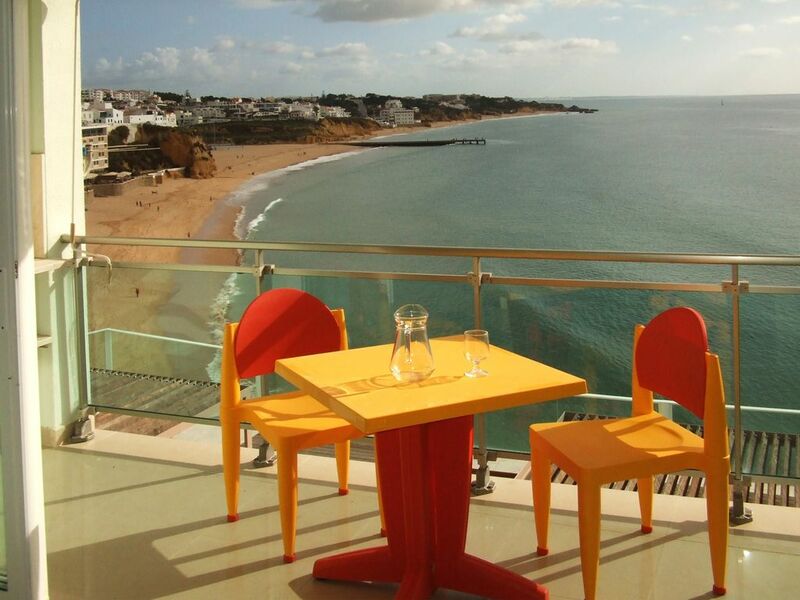 Apartment comfortable, good location, great owners, we plan to visit Albufeira again! We stayed here for 1 week and it did not disappoint! The views were truly amazing from the deck and master bedroom. We loved the location of this apartment - it was very close to the main downtown square, but far enough away so that it was quiet and peaceful. You walk out the front door and you are literally at the elevator to go down to the beach. Carlos and his wife are so sweet and readily answered all of our questions during our stay. We would definitely stay here again! Un séjour extraordinaire,chez des gens exceptionnels !!! L'appartement est parfait,tout y est !! La vue magnifique sur la mer, un équipement ou rien ne manque, plus de 100 m2 de disponible, une situation proche du centre ville,que demander de mieux !!! De plus ,nos hôtes sont très proches de nous,et volent tout de suite à notre secours en cas de besoin.J'ai dû me rendre à l'hôpital, Carlos m'a tout de suite proposé de m'accompagner,et compte tenu de la langue,celà m'a été d'une grande utilité. Grand merci encore à vous deux. Gérard et Ghislaine. A vista da praia a dois minutos e do mar que o apartamento têm dá gosto de caminhar na praia .